Once the contact is created, the application checks the Google App’s Domain Shared Contact list to determine whether a contact already exists with the same email address and Name.If the Contact does not exist, the application creates a new Google Contact in the Domain Shared Contact List.If a Contact does exist, the system updates the Google Contact if Last Modified Time of the NetSuite Contact is greater than that of the Google Contact. System also stores the mapping id.If there are more matches than one, the system does not update any contact in Google’s Domain Shared Contact list to avoid updating the wrong contact. If the NetSuite contact is not mapped to an existing Google Contact, the following steps are taken:The application checks the Google App’s Domain Shared Contact list to determine whether a contact already exists with the same email address and Name.If the Contact does not exist, the application creates a new Google Contact in the Domain Shared Contact List.If a Contact does exist, the system updates the Google Contact if Last Modified Time of the NetSuite Contact is greater than that of the Google Contact. System also stores the mapping id.If there are more matches than one, the system does not update any contact in Google’s Domain Shared Contact list to avoid updating the wrong contact. For each changed Google Contact, the system searches NetSuite for contacts with the same email address and Name combination . If one match is found and if the Last Modified Time of the Google Contact is greater than that of the NetSuite contact, the application updates the NetSuite contact information and mapping id.If more than one match is found, the application does not sync the Google Contact to NetSuite.If no matches are found, the system creates a new contact in NetSuite and maps the Google Contact data to the newly created NetSuite data. If the Google contact is not mapped to an existing NetSuite Contact, the following steps are taken:The application checks the NetSuite Public Contact list to determine whether a contact already exists with the same email address and Name.If the Contact does not exist, the application creates a new New Public NetSuite contact.If a Contact does exist, the system updates the NetSuite Contact if Last Modified Time of the Google Contact is greater than that of the NetSuite Contact. System also stores the mapping id.If there are more matches than one, the system does not update any contact in NetSuite Public Contact list to avoid updating the wrong contact. When a contact is deleted in Google, the corresponding Contact is not removed from NetSuite. 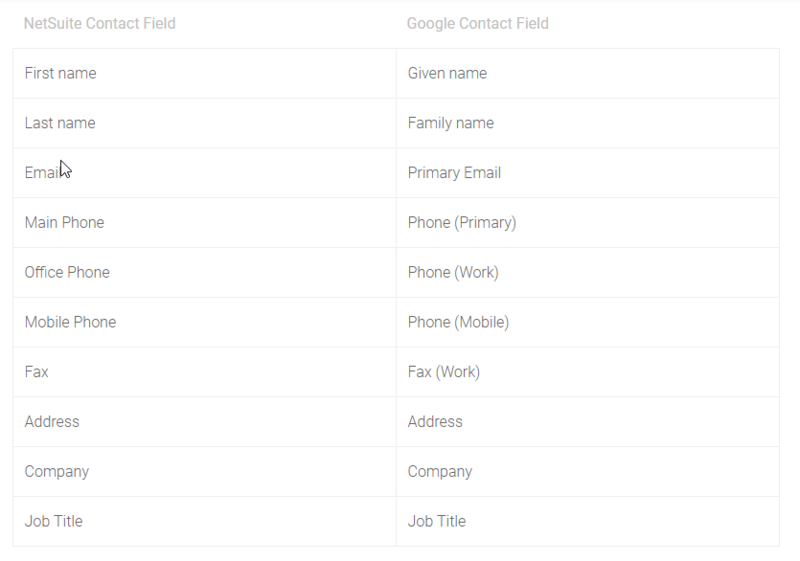 The application instead performs the following actions:The Google Contact ID custom field is set to empty on the NS contact record.The NS contact is marked as Inactive.